The Pisces man is difficult to pin down, most of his true feelings are hidden. He is attracted to anything stress free and without a competitive edge because he hates restriction but on the other hand, he is also attracted to things that stir his emotions, including women. 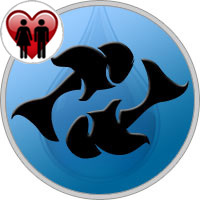 Pisces man is notorious for choosing the wrong woman, he tends to be unlucky in love and have dating relationships full of peril. When confronted with complicated issues, he tends to retreat into his dream world and wears his "rose colored glasses". This is why Pisces man can be very temperamental and pretend there is nothing wrong when your relationship is on rocky ground. When life is not going so well, he can be very hard on himself and very self destructive so it is better for him to live in denial. The Pisces male needs a firm, strong woman to guide him because he is very indecisive and is known for sitting on the fence. The woman has to take the lead in the dating relationship. This need for nurturing is often what attracts women, women love to make him feel good and protected, sort of like a mother’s instinct. The mystery of the Pisces male makes dating him unlike any other astrology sign, nothing is ever cut-and-dry, there is always the element of the unknown and a slight unreachable quality that keeps a woman’s interest. If you like drama in your dating relationship, the Pisces man is for you. Your ultimate goal will be to be invited into the secret realm of his life, where he experiences things and plans ideas that no one on the outside will ever know about. To be invited into the Pisces man’s mind is like being invited into another world, you can be part of his exclusive bubble and both can feel safe, warm and secure. He will protect you and cherish you and you will have a fulfilling romantic partner because he has an amazing ability for love. This is the ultimate goal in a long term relationship and this is very difficult to achieve. It takes the right amount of patience, tolerance and acceptance. Also you have to show your man kindness and sympathy because as the sign of self-undoing, he is very hard on himself and sometimes lacks motivation. The Pisces male tendency for secrecy can either stir a woman or frustrate her. He needs a woman with patience. The Pisces male is a sucker for a pretty girl, any beautiful woman can date a Pisces. He lives in a world of fantasy, remember? Love is full of drama, dating is full of ups and downs but this is what makes dating or falling in love with the Pisces man so great, it is an interesting experience full of passion, distance, thought, emotion and any other intuitive feelings, it is an emotional experience that you will hold on to forever. How to know if a Pisces man loves you? Pisces men are more romantic than most and typically when they fall in love they fall hard. This can often make them somewhat shy initially and therefore hard to read. The clues are more subtle than for most other signs, and your own intuition will determine how many you notice. If you aren’t the intuitive type then you may have to just ask! One common side effect of this is that Pisces often date more outgoing partners, as relationships with those who are equally shy and reserved often take a very long time to start. One of the most frustrating combinations for me (as a practicing relationship astrologer) is having two Pisces who both refuse to make the first move! Dating a Pisces man will be like taking a dog for a walk on a retractable lead. If you are concerned about him and try to keep him close by he will be tugging at the lead to get away. If you loosen it and let him go as far as he wants he will have a little sniff around and then return to your side. Often it is a matter of knowing him and also how to treat him. Now it could be time to play him at his own game. It is your time to be taken for a walk and when he lets the lead out – go for it. Make it look like you want your own freedom and will be just as happy away from him as you will be nearby. It is now that he will become worried. He always thought he was the one calling the shots and pulling the strings, but now you are teasing him. He will see you as a much stronger person than he thought you were and this will entice him. He needs someone strong and it is then that he may decide to commit. It may be best not to let him know what you did as although he needs someone strong he may not want to admit it. Once he has made his decision he knows he needs to keep you. He may be difficult to tame but part of him does not want to go through the same old routine time and time again. He believes he has won here and got what he wants and is determined to keep it. Now you may be treated the way you should have been in the first place with flowers and chocolates and lots of kind words. He is now able to behave the way he wants to and as he trusts you he will become a more kind and gentle person. You can still ruin this by breaking the trust as he needs you to be proud of him but also desire him. You may now be asking yourself if it is worth putting yourself through this torment and need to look at what you may get out of it. It is clear what you need to put in and what you will have to put up with, but the rest is still unknown. At times it may be worrying how dependent he has become on you. You will have the pressure of helping him along his way and the fear that any of his failings may be your fault as you damaged his fragile ego. Teaching him to be strong for himself will not be easy. Be warned that as a couple you may see a grown man cry. His initial reluctance to open up to you will disappear and he will now want you to know everything. This will include his hopes and dreams along with his deepest fears. This is where the tears come in. He can express himself much more openly as part of a couple and you may not like it but you will have to get used to it. It is best to remember that this is what you wanted when he was holding back. How often did you wish he would tell you what was wrong and show at least a little vulnerability? You now have what you wanted and must accept it. You asked for openness and now have it. It may be hard for you to accept that the man who led you such a dance in the early years is now dependent on you. If it is frightening let him know. He will react better to knowing that you are scared rather than that you are bored and may not want to be with him anymore. At the same time he may be annoying you by asking if you really care he will be secretly terrified of losing you. He will ask you how you feel about his best friend and worrying about the reaction, yet he will not tell you that he enjoys hearing your favorite song even when you are not there and going to your favorite places even if you’re not around. By the time you are an established couple things could have well gone in a complete circle. At the beginning he was running rings around you and now he is at your beck and call. If you care for him as much as he now clearly cares for you make sure you look after him and give back what he gives so freely.